The author fighting a Tarpon in Nicaragua hooked on a jig. Tarpon (also known as “The Silver King” or “Sabalo” in Spanish) are a majestic fish that deserves entire books written about it, not just this woefully inadequate website summary. The Tarpon grows to over 7ft in length and over 300lbs and is generally found close to shore, making it one of the larger fish that someone can target without a big boat. Tarpon can live in both fresh and salt water because they are able to gulp air directly. They primarily eat fish, shrimp, and crabs. Tarpon have very large scales that make a nice souvenir after you release one. The bone-hard mouths make them difficult to hook. Once they are hooked, the jump repeatedly while thrashing around wildly. They often throw the hook or part the leader when they do this. It is an awe-inspiring sight to see a 6ft fish leap 10 feet out of the water right next to your boat. I hooked quite a few Tarpon before I landed one. Time after time I would have fish jump out of the water and throw my lure right back at me. It got very frustrating, but once I started fishing for them with bait and circle hooks my success rate went up dramatically. It’s certainly possible to land them on lures but you will lose more than you land. Rather than talking about how many Tarpon they caught, people talk about how many Tarpon they “jumped”. Tarpon are not good to eat and have a large number of annoying bones so they are usually released. 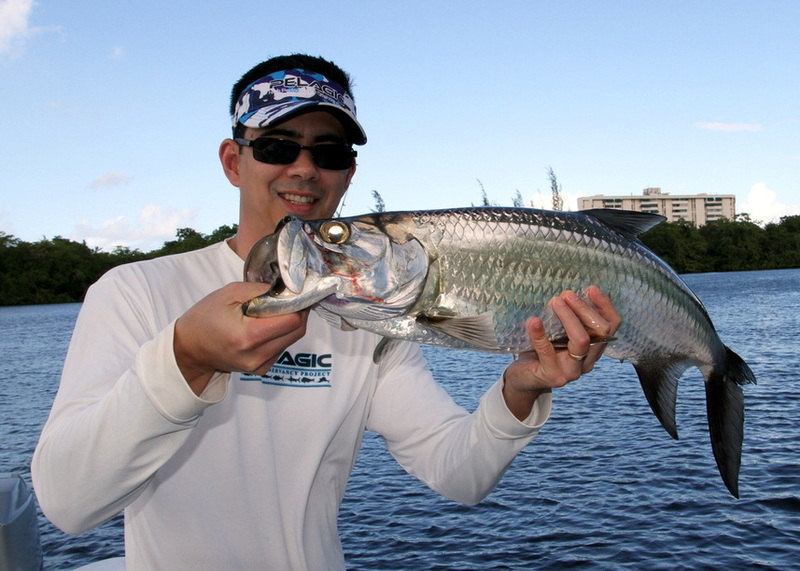 You don’t need super heavy tackle to fish for Tarpon. I have heard of people landing Tarpon over 100lbs on 8lb test line. I don’t recommend that unless you have caught so many that you are getting bored and need a challenge. 30lb test should be light enough to give you a battle but heavy enough to not overtire the fish in most situations. Braided line will work but monofilament absorbs the shock of their violent thrashing better. Obviously you should scale down if you are fishing for juvenile tarpon, which in my experience are no easier to hook than the large ones. A good medium size outfit is an Accurate Trinidad 16N or a Daiwa Saltiga spinning reel. Tarpon are caught nearshore and also in rivers and estuaries. They can be caught on bait or lures but bait with a circle hook will give you the best chance of landing them. Trolling with Rapalas will generate some bites but you will not land a very good percentage. That technique is mostly just good for sharpening your reflexes as you have to duck quickly when the Tarpon jumps and throws the Rapala straight back at you. Using sharp, preferably single, hooks will help cut that down a bit. I have hooked a lot of Tarpon on jerkbaits like the Yo Zuri Crystal Minnow but landed very few because the treble hooks almost always get dislodged. In the right situation they will bite a variety of lures including poppers, soft plastics, and jigs. Whatever you use, you should try to use something with a single hook (harder to throw) and that doesn’t give the Tarpon much leverage to shake it loose. For example, they will bite jigs in many situations. I recommend adding a soft plastic tail to a bucktail jig and jigging it off the bottom in Costa Rica or Nicaragua. If you get a bite, set the hook hard at least 5 or 6 times. Because you are fishing on the bottom, you should get plenty of chances to set the hook before the fish jumps. Some fishermen have had success with lures that slide away from the hook in order to give the fish less leverage. Many of my Tarpon landed have been caught on live or dead sardines. I always use a circle hook. You just wait until a Tarpon has taken the bait and is swimming off, then put the reel in gear and start reeling to get the circle hook caught in the corner or top of its mouth which are the two places you can hook them where it might actually stick. Once you have hooked a Tarpon, it will almost always immediately leap into the air and start thrashing around. As soon as it gets in the air you have to immediately drop the rod tip to make the line slack. This is one of the few situations in fishing where you want slack line while fighting a fish. This is called “bowing to the King”. If you keep the line tight, it makes it much easier for the Tarpon to snap the line with its violent head shakes. Even when you know you should bow to the King, it can be hard to do because the leaps can be so sudden, especially the first one. Raise the rod and reel the line tight as soon as the fish re-enters the water. Once it has stopped jumping you should put as much pressure as you can and change angles frequently. This disorients the fish and helps you get it in sooner. If you just apply constant pressure from one direction it will figure out how much resistance it needs to put up to avoid being reeled in and it will put up just that much resistance. Also, if you let it rest during the fight it will come up, gulp some air, and get a second wind. When I was fishing in Costa Rica a few years ago using the above techniques I was able to land Tarpon ranging from 70-130lbs in 15 minutes or less. Some other guys were fishing using the same tackle in the same area. Each of them was only able to reel in one fish because it took them over an hour to get each fish in. They were putting constant steady pressure on the fish (and occasionally letting them rest) rather than varying the angles and really pulling hard. After one fish each they were done for the morning and headed back. It is important that your line always be moving. If line is not peeling off your reel, you need to be reeling. If you let the fish rest they will take much longer to catch. The biggest Tarpon in the world are all caught in Africa (Sierra Leone is supposed to be good) but I have no experience with that fishery. From what I have read you don't get a lot of fish, but the few you get are big. Florida has plenty of fish but I have never had much luck with them there because they are so heavily pressured. The Caribbean side of Costa Rica is where I have had my best luck. One day I landed 13 fish between 8-11am, and the biggest was around 130lbs. A very similar fishery is found in southeast Nicaragua. Tarpon caught on Nicaragua on a bait. A tarpon sunning itself in 2 feet of water in the Keys in Florida. This guy clearly knows that fishing is not allowed in this spot.